A DART train leaves the West End Station in downtown Dallas. Dallas Area Rapid Transit and Coors Light are partnering to deliver a safe alternative to driving on New Year's Eve with free DART rides on all buses, trains, Paratransit Services and the Trinity Railway Express (TRE) between Union Station and CentrePort/DFW Airport Station. "Customers are encouraged to FREEZE THE KEYS and let DART be their designated driver, courtesy of Coors Light Free Rides," organizers said in a prepared release. "The partnership between Coors Light and DART means no passes, coupons or fare of any kind required for a free ride on Dec. 31, from 6 p.m. to end of service." Since its inception in 2015, more than 6.4 million people around the country have utilized the Coors Light Free Rides program -- in 2107, more than 20,000 North Texans used the program. Free Rides will also be offered on New Year's Eve in Chicago, Denver, Milwaukee, Minneapolis and St. Paul, MN and Phoenix. Red Line to Parker Road Station - 1:41 a.m.
Red Line to Westmoreland Station - 1:18 a.m.
Blue Line to Downtown Rowlett Station - 1:18 a.m.
Blue Line to UNT Dallas Station - 1:16 a.m.
Green Line to Buckner Station - 1:08 a.m.
Green Line to North Carrollton/Frankford Station - 1:26 a.m.
Orange Line to Parker Road Station - 12:24 a.m.
Dallas Streetcar - A final streetcar leaves Union Station at 12:50 a.m. and Bishop Arts at 1:09 a.m.
Paratransit - Regular service provided. Customers may begin calling Fri., Dec. 28, to schedule service through Wed., Jan. 2. Customers should call 214.515.7272 and choose Option 3 to schedule their trip. Next day scheduling is also available using X-Press Booking, web booking or semi-automated voicemail. DART Police will have extra patrol units on duty to assist where needed, especially in downtown and around West End Station. On New Year's Day, DART's administrative offices are closed and bus and rail service will follow a Sunday schedule. 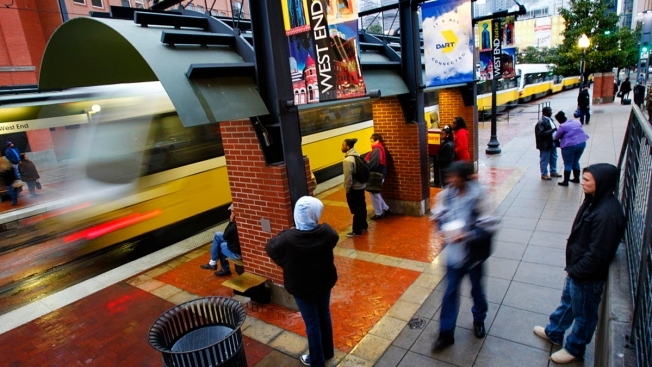 There will be no TRE service on New Year's Day. Paratransit Services for customers with disabilities will operate on a Saturday schedule.